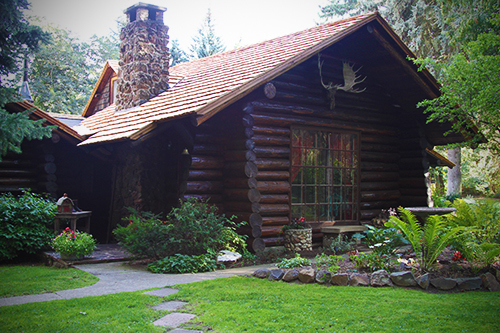 Littlebrook is a hand-hewn log home crafted from 1935 to 1944 by Mr. Oliver Lajoie for John T. Little, the original owner. Mr. Little was a Spokane pioneer and founded the John T. Little Hardware and Sporting Goods Store in downtown Spokane. 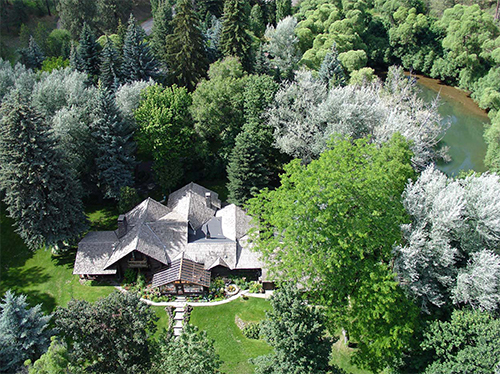 Littlebrook is a 12 room, 4 bedroom, 4 bath log lodge located on a beautifully landscaped 6 acres highlighted by several water features. A stream meanders through the six-acre property connecting the one-acre trout pond, dam, and waterfall. Over the past 18 years, the home has been meticulously and lovingly restored to its original splendor by Paul and Deneice (granddaughter of John T. Little) Hastings. Green cedar logs of 20 to 30 foot lengths were obtained from nearby Colville, Washington. All logs were hand-cut, scribed, and notched with a sharp, double-bitted axe. Knots were all hand-trimmed, leaving a swirling wood grain pattern. No nails or pegs were used as whole logs were coped and placed horizontally, one on top of the other, with saddle-notched corners. The log structure was constructed around a four-room cottage built in 1905 by the W.R. White family. The property is divided north and south by Dartford creek. Mr. Little dammed this creek into a tree-lined, one acre trout pond butting up against a naturally forested hillside. The dam also made for a beautiful waterfall spillway that falls into the creek which traverses through the southern portion of the property. This creek is home to native Redband trout. 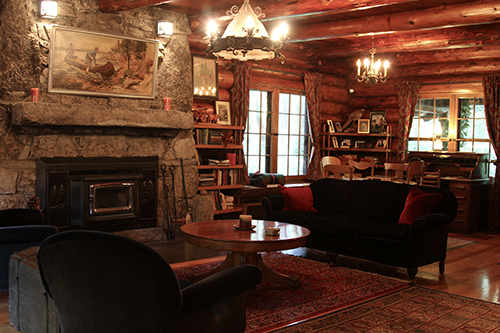 Over a nine year period between 1935 and 1944, Mr. Lajoie, virtually by himself, handcrafted the existing two-story, twelve-room, 3,650 square foot log home. Each room is unique, featuring many handcrafted and forged details, fittings, and cabinetry. Thirteen large log halves create the dramatic staircase down to the entryway and large, lodge-like room. The entryway slate porch is covered with a gabled roof. A large granite fireplace was built by Edward Z. Little (no relation), a stone tile mason who did much of the tile work for Spokane’s famous architect, Kirtland Cutter. This granite came from a quarry at nearby Diamond Lake, WA. The north end of the room has four-over-four sash windows. On each side of the windows are large, historic, beveled glass mirrors in “leaf motif”, hand-carved frames taken from the nearby Deer Park Saloon. The central lighting is provided by three large crystal chandeliers from Paris, one each in the entry, living, and dining rooms. French doors on the east wall lead to the slate patio covered with a gabled shake roof and handmade light fixture. The living room floor has six-inch-wide eastern oak planking as well as a slate hearth in front of the fireplace. The second story is above the 20′ x 35′ living area. This includes two bedrooms with open gabled ceilings, one with multiple muntin bar windows, the other, a divided glassed, rustic lit door, leading out to a balcony overlooking the park-like treed backyard, solarium, gazebo, and stream. The upstairs bathroom is made of hand-cut pine siding, river rock wainscoting, and tile flooring. A one-hundred-forty year old pedestal sink from Senator Turner’s south Spokane home is the centerpiece of this bathroom. Special details include an original hand built, chrome-plated glass shower as well as a handcrafted door to an outside roof, built in drawers, and cabinets with small animal horn handles. There is a 680 square foot, finished basement under the living area which has a cement foundation. 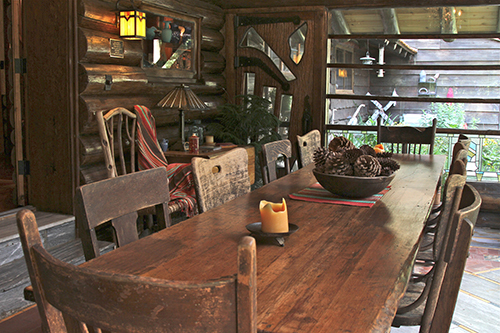 Off the living room is a dining area with a log wainscoting and stucco wall above. Two glass window boxes face into the solarium. The floors are stained, shellacked fir. French doors lead out to the step-down solarium which is composed of glass walls. All doors, woodwork, hardware, and unique light fixtures are handcrafted or forged. There is a row of leaded glass along the walls, and the flooring is a combination of marble and Italian mosaic tiling. The newly restored kitchen has the original pine siding, cupboards, and cathedral ceiling. The new countertops are slate-like tile, and the flooring is the original refurbished fir. All appliances are new, stainless steel except for a fully restored 1927 Monarch wood cook stove. Connected to the kitchen is an eating nook area with a large picture window viewing the stream and gazebo. This area leads to a small sitting library and cozy den with a wood burning stove and large windows overlooking the pond. A restored bathroom with original claw foot tub and hand built cabinetry is off the den. The mudroom provides convenient entry to this side of the first floor from the two car garage and kennel. As you pass through French doors from a study/dressing room to the large master bedroom, you will be greeted by a stone fireplace and a master bath. The master bedroom features restored fir flooring, very large mutton bar windows with a garden view, and a newly restored master bedroom.